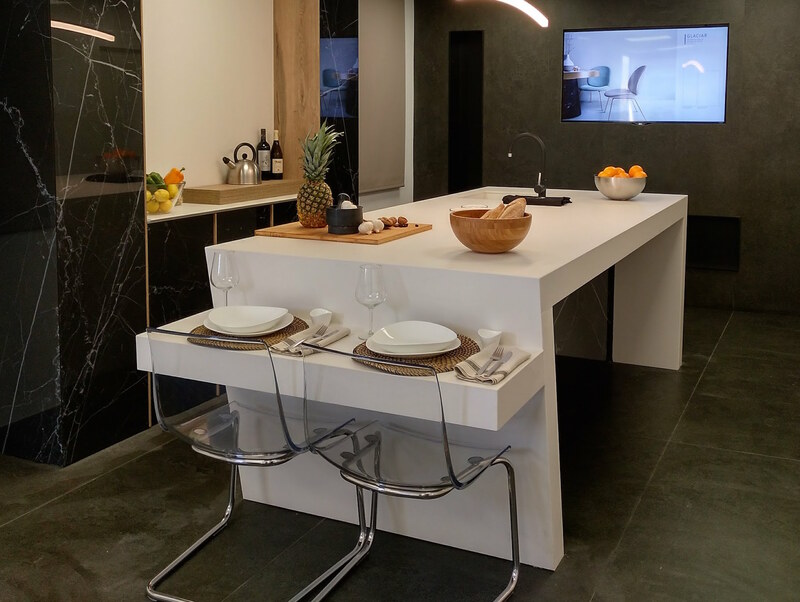 Arklam 12 mm is a coloured sintered mass with which we can achieve fully integrated designs for the creation of sophisticated kitchen countertops thanks to its two finishes. Satin-finish matt, highly resistant and polished, with a mirror reflection that provides depth and elegance. Arklam’s surface resists high temperatures and thermal shocks. These characteristics are essential in a kitchen where contact with hot pots or pans and tools that can damage the countertop is frequent. High temperatures and sudden thermal changes do not affect this material, thanks to its technical characteristics. Arklam not only withstands the high temperatures of a kitchen, but also allows you to use fire directly on its surface without any damage. During its manufacture, the material is subjected to high temperatures, which increases and guarantees its total resistance. Scientific evidence shows that highly porous materials are a greater focus of bacterial growth than non-porous materials. Arklam’s sintered dough is a compact, non-porous material that is recommended for kitchen countertops, spaces where hygiene is particularly necessary. Arklam has important features such as extreme compactness and non-porosity, making it an ideal choice for kitchen countertops. These qualities make it an optimal material for food processing directly on the surface, as there is no danger of staining the material. It can be easily cleaned without leaving any trace of the food. Due to its low porosity (< 0.5%), Arklam is a material that does not absorb fatty substances. This surface is easy to clean and has minimal maintenance. As this material is impenetrable, even the most difficult stains can be easily cleaned. Oil, wine, sauces, coffee, acidic substances (such as lemon or vinegar) and detergent residues are cleaned effortlessly. A kitchen countertop is subjected to very intensive use and can be damaged by knives or sharp tools. Arklam’s sintered mass is a very durable material that does not scratch, thanks to its natural strength. Arklam is a totally environmentally friendly product, both in terms of manufacture and maintenance, as the amount of chemicals to be used for cleaning is limited. Arklam is committed to minimum environmental impact.